Pulkovo Airport in St. Petersburg, Russia, was evacuated after a call of a bomb threat, the airport’s press service told RT. A similar call was received by Moscow’s Domodedovo Airport, however no evacuation was carried out. Though the evacuation of Pulkovo, servicing the northern ‘capital’, was confirmed to RT by press secretary Anna Fedoseeva, the airport’s virtual flight board on its website was showing no changes to the airport’s operations. 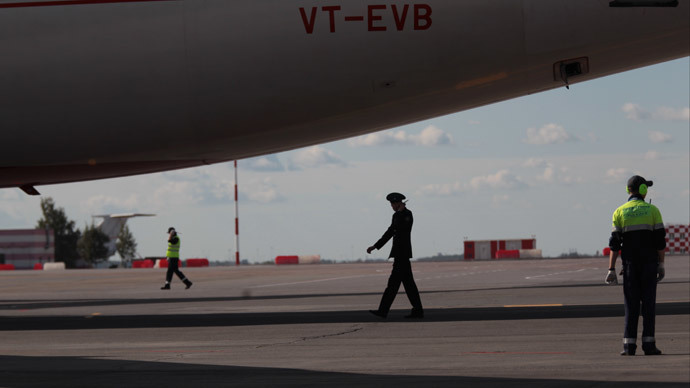 After a while operations at the airport were fully restored, according to the operator company the “Air gate of the northern capital,” ITAR-TASS reported. The company’s statement said that the message regarding the bomb threat was received at 13.30 GMT, and the operation was restored at 16.02 GMT. Moscow’s southern Domodedovo Airport received a similar call saying that an explosion is being prepared in Terminal B. However, there is no such terminal at Domodedovo. The airport is operating and no evacuation will be carried out, the organization’s press service told RT. Police are trying to establish the identity of the callers. In May, there were two anonymous calls regarding an alleged impending explosion at Pulkovo. Both times the airport was evacuated, but fortunately no explosions followed. St. Petersburg’s Pulkovo is the third busiest airport in Russia after Moscow’s Domodedovo and Sheremetyevo Airports. Calls with fake bomb threats became much more common in Russia after the Domodedovo Airport suicide bombing on January 24, 2011, which killed at least 37 people and injured 180 more. The attacker was later identified as Magomed Yevloyev, a 20-year-old from the North Caucasus, a member of the faction of the Caucasus Emirate led by terrorist Doku Umarov. The attack was aimed "first and foremost" at foreign citizens, the group said. At least seven foreigners were killed in the bombing, one person each from Britain, Germany, Austria, Ukraine, Tajikistan, Kyrgyzstan and Uzbekistan. Since that incident a complete security check has been introduced for those entering Domodedovo Airport and the number of officers working with sniffer dogs and police staff has been increased.